The 2012 American Eagle Silver Proof Coin will continue an extremely popular series of collectible strikes from the US Mint. Each coin is struck from one ounce of .999 fine silver with a diameter of 40.60mm. Proof Silver Eagles first made their appearance in 1986. They were created as numismatic versions of the bullion Silver Eagles which had been directly authorized by Congress. Three main differences separate the bullion and the proof quality coins. First, bullion coins are struck for investors whereas proof coins are produced for collectors. Second, bullion coins are sold through the Mint's network of authorized purchasers whereas proof coins are sold directly to the public by the US Mint. Finally, while the obverse and reverse imagery is similar on both, the bullion coin is struck to bullion quality without a mintmark while the proof coin features a proof finish and does contain a mintmark. 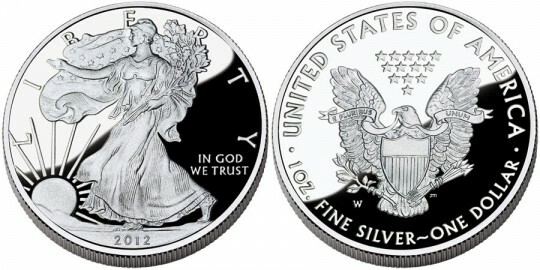 Proof Silver Eagles have been struck annually since their debut, with the exception of one year. In 2009, bullion demand of record level forced the Mint to cancel production of the Proof Silver Eagle. The obverse of the coin contains what many considered to be one of the most beautiful designs ever struck on an American Coin - "Walking Liberty" as designed by Adolph A Weinman for the 1916-1947 half dollar coin. Also shown on the obverse are the inscriptions of "Liberty," "In God We Trust" and the year. The reverse was designed by US Mint Engraver John Mercanti to show a heraldic eagle with shield. In the beak of the eagles are the words "E PLURIBUS UNUM". Also visible around the edge are "UNITED STATES OF AMERICA", "1 OZ. FINE SILVER" and "ONE DOLLAR".